No need to stress over picking all the 8DM chimney components for your IHP/Superior, Vantage Hearth, DESA or Vanguard woodburning fireplace; this vent kit includes everything needed for an in-home installation. Simply choose your required chimney height (measured from the top of the fireplace) and the appropriate roof pitch option and you will receive the corresponding pipe lengths and roof flashing. The kit also includes one firestop, a storm collar and a round chimney cap with a mesh screen. Building a chase for your IHP/Superior, Vantage Hearth, DESA or Vanguard woodburning fireplace? This venting kit contains all the necessary components for the 8DM class A chimney pipe. All you have to do is choose the necessary chimney height you need - measured from the top of the fireplace - and you will receive the corresponding pipe lengths, two firestops, a storm collar and a round chimney cap with mesh screen. IHP/Superior Wood Fireplace 8 Inch x 12 Inch Chimney Pipe. Only IHP/Superior Chimney Wood Fireplace Chimney Liners and Chimney Liner Accessories are approved for use with IHP/Superior Wood Fireplaces. They are UL approved and are not for use with any product other than IHP/Superior Wood Burning Fireplaces. IHP/Superior Wood Fireplace 8 Inch x 18 Inch Chimney Pipe. Only IHP/Superior Chimney Wood Fireplace Chimney Liners and Chimney Liner Accessories are approved for use with IHP/Superior Wood Fireplaces. They are UL approved and are not for use with any product other than IHP/Superior Wood Burning Fireplaces. 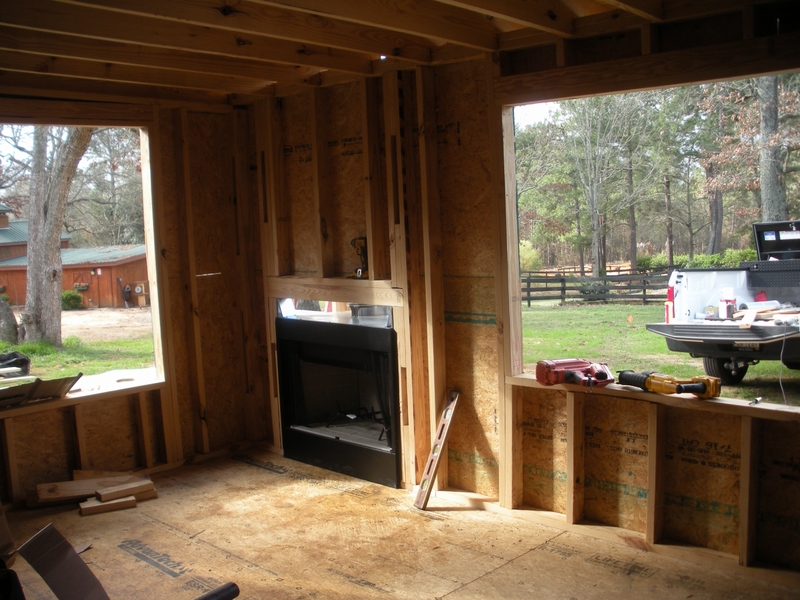 The most difficult part of installing a woodburning fireplace is adding a chimney and vent system. This 24 inch pipe length from IHP/Superior helps eliminate the hassle by providing a product that can fit perfectly together with other IHP/Superior products of the same size. When using these compatible products together, the difficult process of installing vents for your woodburning fireplace can become a much easier task. The double walled exterior of this pipe also helps to create an insulated barrier between the heat inside and the combustibles on the exterior of the piping. IHP/Superior Wood Fireplace 8 Inch x 36 Inch Chimney Pipe. Only IHP/Superior Chimney Wood Fireplace Chimney Liners and Chimney Liner Accessories are approved for use with IHP/Superior Wood Fireplaces. They are UL approved and are not for use with any product other than IHP/Superior Wood Burning Fireplaces. IHP/Superior Wood Fireplace 8 Inch x 48 Inch Chimney Pipe. Only IHP/Superior Chimney Wood Fireplace Chimney Liners and Chimney Liner Accessories are approved for use with IHP/Superior Wood Fireplaces. They are UL approved and are not for use with any product other than IHP/Superior Wood Burning Fireplaces. IHP/Superior Wood Fireplace Firestop Spacer for 8 Inch Chimney Pipe. Only IHP/Superior Chimney Wood Fireplace Chimney Liners and Chimney Liner Accessories are approved for use with IHP/Superior Wood Fireplaces. They are UL approved and are not for use with any product other than IHP/Superior Wood Burning Fireplaces. IHP/Superior Wood Fireplace 30 Degree Elbow for 8 Inch Chimney Pipe - Pair. Only IHP/Superior Chimney Wood Fireplace Chimney Liners and Chimney Liner Accessories are approved for use with IHP/Superior Wood Fireplaces. They are UL approved and are not for use with any product other than IHP/Superior Wood Burning Fireplaces. Adding a vent to your heating appliance can be the most difficult part of putting a fireplace in your home. With this spacer kit from IHP/Superior, you can increase the distance between your piping and combustibles, and you can improve the safety of your ventillation system. This spacer provides an additional 2 inches of clearance, and it allows you to install your piping even in tight spaces. The easy to install design allows you to quickly and easily install this and benefit from the durable materials that will provide protection for years. The IHP/Superior Wood Fireplace 0-6/12 Pitch Roof Flashing is to be used with IHP/Superior wood burning fireplaces. It is available for eight inch diameter and twelve inch diameter chimney venting pipes. It offers approved protection with IHP/Superior wood fireplace chimney liners and chimney liner accessories for IHP/Superior wood fireplaces. It is not approved to be use with any other products outside of IHP/Superior wood burning fireplaces. The 0 - 6/12 Pitch Roof Flashing is only available for 8 inch and 12 inch chimneys. This part is a component in the IHP/Superior 8" wood burning chimney vent pipe system and is used to prevent water damage to your flue or your home because of the hole cut in your roof for the vent. The flashing is appropriate for use with pitched roofs with pitches from 7/12 - 12/12. The rest of the termination may include a top plate, storm collar, and rain cap to both protect your chimney vent and to give it the support and stability at the top that it needs. IHP/Superior Wood Fireplace Storm Collar for 8 Inch Chimney Pipe. Only IHP/Superior Chimney Wood Fireplace Chimney Liners and Chimney Liner Accessories are approved for use with IHP/Superior Wood Fireplaces. They are UL approved and are not for use with any product other than IHP/Superior Wood Burning Fireplaces. IHP/Superior Wood Fireplace 8 Inch Round Cap with Mesh. Only IHP/Superior Chimney Wood Fireplace Chimney Liners and Chimney Liner Accessories are approved for use with IHP/Superior Wood Fireplaces. They are UL approved and are not for use with any product other than IHP/Superior Wood Burning Fireplaces. This large Round Top with attached Louvered Screen is another high-quality chimney component by IHP/Superior, and is designed to protect your chimney from falling debris, small pests, and weather damage. This chimney top is designed to be used with the IHP/Superior 8 in. diameter wood burning chimney ventilation pipe installation. The IHP/Superior chimney liner accessories are UL Listed and approved and are intended for use with IHP/Superior chimney relining pipe only, and are available in 8 in. and 12 in. diameter sizes. Once you have installed the vent pipes for your ventillation system, it is important to add a quality termination to the end of your vent system. With this termination from IHP/Superior, you can get a protective barrier between your fireplace system and the outside of your home. By using this vent system, you can keep animals and debris from entering your vents and causing damage, and you can still get the necessary air flow that helps maintain the necessary ventillation. IHP/Superior Wood Fireplace 8 Inch Econo-Top - Best for Chase Application. Only IHP/Superior Chimney Wood Fireplace Chimney Liners and Chimney Liner Accessories are approved for use with IHP/Superior Wood Fireplaces. They are UL approved and are not for use with any product other than IHP/Superior Wood Burning Fireplaces. IHP/Superior Wood Fireplace 8 Inch Black Econo-Top - Best for Chase Application . Only IHP/Superior Chimney Wood Fireplace Chimney Liners and Chimney Liner Accessories are approved for use with IHP/Superior Wood Fireplaces. They are UL approved and are not for use with any product other than IHP/Superior Wood Burning Fireplaces. IHP/Superior Wood Fireplace 8 Inch Square Top with Slip Section. Only IHP/Superior Chimney Wood Fireplace Chimney Liners and Chimney Liner Accessories are approved for use with IHP/Superior Wood Fireplaces. They are UL approved and are not for use with any product other than IHP/Superior Wood Burning Fireplaces. With this ventillation termination from IHP/Superior, you can finish the installation of your vents and complete your vent system. By adding a termination to your fireplace's vent system, you can increase the protection around your fireplace and minimize the chance of having damage resulting from buildup or excess debris that makes it into your piping. This sturdy termination is a great addition to any vent system, and the durable materials ensure that it is built to last. * Please Note: This model is a direct replacement to the previously available FMI Bungalow B36F. Fireplaces with a smooth face tend to elicit a great deal of admiration of their onlookers. The Superior is more than capable of this. Described as being a builder 36 Inch Radiant Wood Burning Fireplaces, you and your family will be immensely satisfied with the results that this product will have after being put into your living room, greatly enhancing its value as well as giving to your family a place that they will want to assemble. I'm looking for a rear venting wood burning fireplace. Is that possible with this one? We do not carry any wood-burning fireplaces that are capable of rear venting. Yes, this is UL certified. What does this unit weigh? This fireplace weighs 250 lbs. Is this listed for installation outdoors? No, it is not for outdoor use. 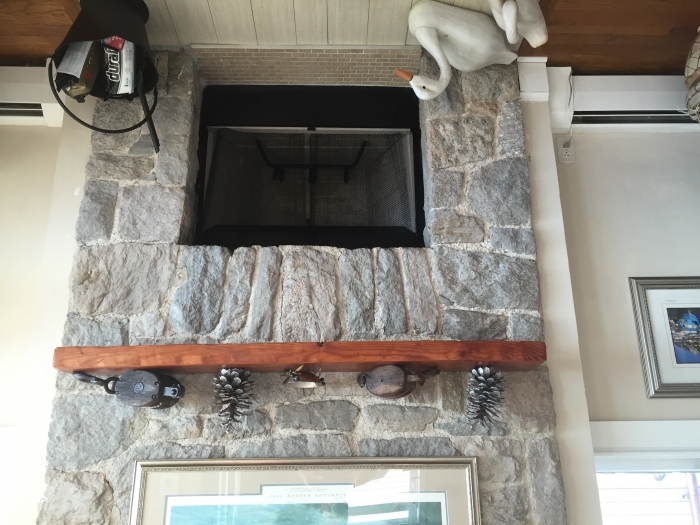 Will this fireplace accept gas logs? 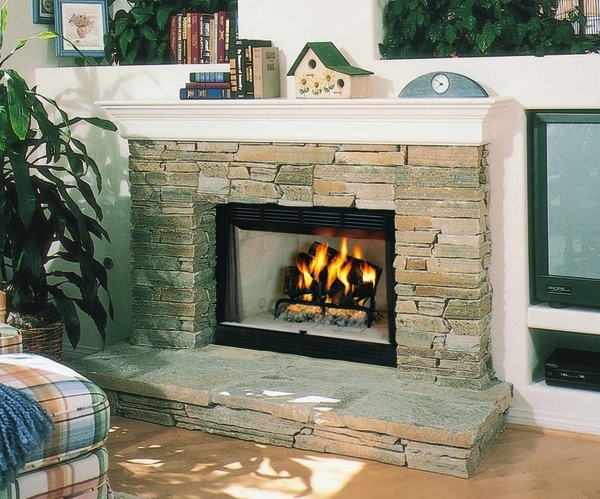 Yes, this fireplace has knockout plates on either side to allow a gas line into the firebox, with which you can install a vented or ventless (where not prohibited by code) gas log set. Please note, however, that even if you plan on installing a gas log set, you still must install the woodburning chimney components. Are there supposed to be glass doors on this? Were they an additional item? Yes, there are optional bi-fold glass doors available in black, brushed brass or platinum trim for this fireplace. You can see this options in the "Popular Accessories for this Item" section on this page. can the facing be covered with stone utilizing adhesive to hide the metal? Yes, you may use any noncombustible material on the face of this unit, up to its opening. A circulating unit can have a fan. A radiant unit will only radiate heat. Does this unit have BTU rating? This unit does not have a BTU rating, as it is decorative and not meant for heating. The majority of the heat from an open faced wood burning fireplace will be lost through the chimney. Do the screen and the front face weldment come with the fireplace? The screen and the face come with this fireplace. Is this unit equipped with a log grate? And does it have a screen attached? This will indeed arrive with a grate for burning wood and a mesh pull screen. Can this product be vented horizontally through an exterior wall or does the vent pipe have to extend through the roof? Wood burning fireplaces, as a category, do have to be vented above the roof line with the amount of pipe above the roof increasing with the roof pitch. Can this product be used outside on a covered patio? Does this require a concrete footing? This unit is meant for indoor installation only. Nice product for the money. We are very happy with our new fireplace and the installation couldn't have been easier. The site was easy to use and the fireplace was delivered within 3 days. 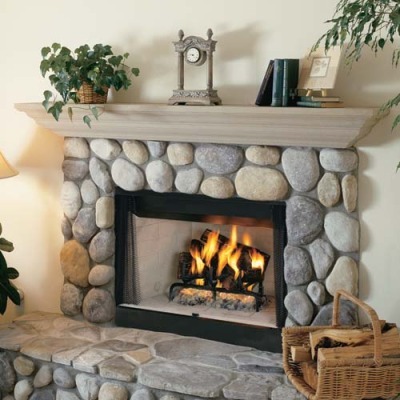 We would highly recommend this site for any of your fireplace needs. I appreciate all the helpful information--it made installing this firebox easy! All has gone well and has met or exceeded our expectations! East installation and great look! ProsGreat value for the price, great look and easy installation! Easier to install than I thought it would be. Really easy to follow directions, I believe nearly anyone could do it.